Model BDI is an inexpensive, easy to install Battery Discharge Indicator (BDI). It is completely solid state and provides a reliable, accurate, and easy to read display of battery state-of-charge. 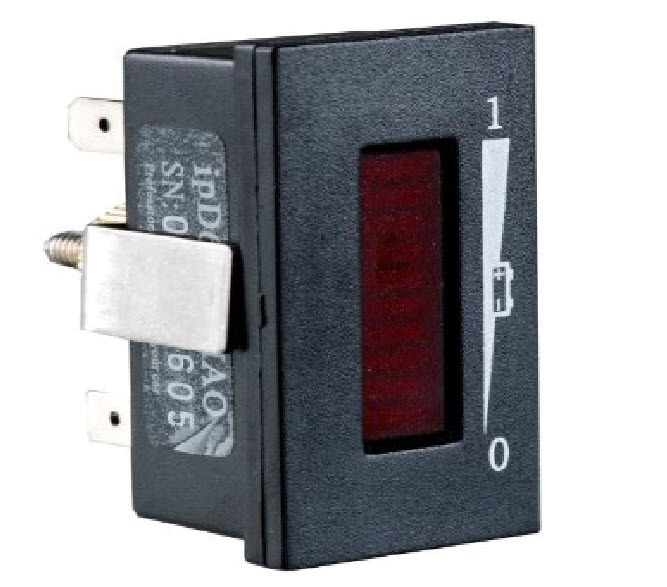 This battery discharge indicator is ideal for golf cars, hunting buggies, commercial leaning equipment, mobility aids, electric bicycles, and similar equipment. Higher integrated circuits for long-life reliability. A 10-bar high light LED displays the state of charge successively, bar by bar. At 70% depth of discharge, a flashing LED signals an ENERGY RESERVE alert. At 80%, alternately flashing LEDs provides an EMPTY status warning. Key switch activated LED display (state-of-charge is monitored as long as the BDI is connected to battery). Upon reconnection of a battery, the BDI will reset to the full status if it measures 2.09 volts/cell or higher. During charging, the BDI will light LED bar by bar according to the increased battery capacity, the BDI will reset to the full state when the BDI measures the voltage of per cell up to 2.35 volts or higher.